KIEV, Ukraine -- Coincidentally or otherwise, Ukraine’s constitutional reform took place precisely when the Parliamentary Assembly of the Council of Europe (PACE) was deliberating functional democracy in this country. It was clear from the outset that the European MPs would have a number of questions addressing the progress of democracy in Ukraine, above all regarding freedom of speech, the judiciary system, and so on. Ukraine’s opposition, in turn, complained about the current go­vernment pressuring the local council election campaign. Opposition party leaders assure the masses that those currently in power are using seven main falsifications, including the dominance of the pro-Yanukovych group at the Central Election Committee, so as to turn the election campaign in their favor; breaches of the proportionality principle when assigning commission leadership; setting up local election commissions/committees with a single political force dominating, and legally sealing the count of votes by such a commission/committee without the legally required quorum. This statement couldn’t be left without response. 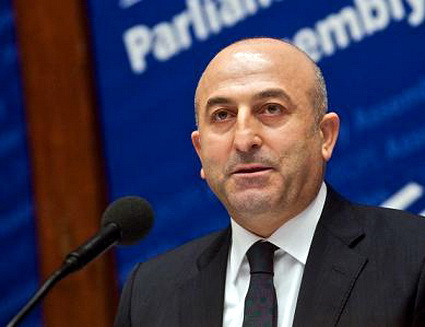 PACE President Mevlut Cavusoglu said the PACE Monitoring Committee would take this opposition parties’ statement into consideration. He added that he hoped that the results of the debate would serve to strengthen democratic institutions in Ukraine and build respect for the basic human rights and freedoms. The resulting PACE draft resolution wasn’t that harsh, except that it voiced the European community’s concern and urged the current Ukrainian government to adhere to European democratic standards. The draft reads, in part, that the Assembly has in mind the ruling of the Constitutional Court of Ukraine that abolishes Law No. 2222, which amended the Constitution of Ukraine in 2004; that the Assembly believes that this ruling will prompt the Verkhovna Rada to initiate a comprehensive constitutional process of reform, aimed at putting the Ukrainian constitution in accordance with the European standard. All findings by the Commission experts will be purely legal by nature, but certain warnings have already been voiced. Thomas Markert, Secretary of the Venice Commission of the Council of Europe, told The Day that they were surprised to learn that a constitution that had been legally effective for six years was suddenly ruled invalid; in addition, the Constitutional Court of Ukraine acted in keeping with the Constitution. This made the situation stand out of the ordinary. In European practice, such cases are usually limited. The Commission of Venice found nothing wrong with the 2004 Constitution of Ukraine in terms of democracy. This issue will be deliberated by the Commission’s plenary meeting scheduled for October 15-16 in Venice. Ukraine is once again faced with a political problem. Its judicial branch appears to have lost its [constitutional] independence, an occurrence that sends the red lights flashing, for it means a return to the authoritarian regime, with only one party in power and operetta opposition — precisely the situation with Russia today. Ukraine is losing its progress potential, for progress is possible only in a democracy. Those currently in power believe the opposition is blocking their way to building a nation-state. They should remember lessons in history about such practices, in Ukraine as well as in Russia. No forums, no tearful promises of adherence to the European course, no requests for a couple of ferries to help passenger turnover, will help overcome the ongoing, and mounting, crisis with the ranking bureaucrats sticking to their [Soviet/post-Soviet] daily practice. The overall impression is that the current [Ukrainian] political leadership is stuck in the past, trying to secure their posts ad infinitum, instead of relying on common sense. To this end, stabilization, brainwashing ads and commercials serve to create the hazardous illusion of a passive electorate. There is public opinion, of course, but for want of legal access it manifests itself by boisterous street rallies, with sad consequences for those who want to screw the bolts tight. Time to cast stones. When will it be time to collect them?